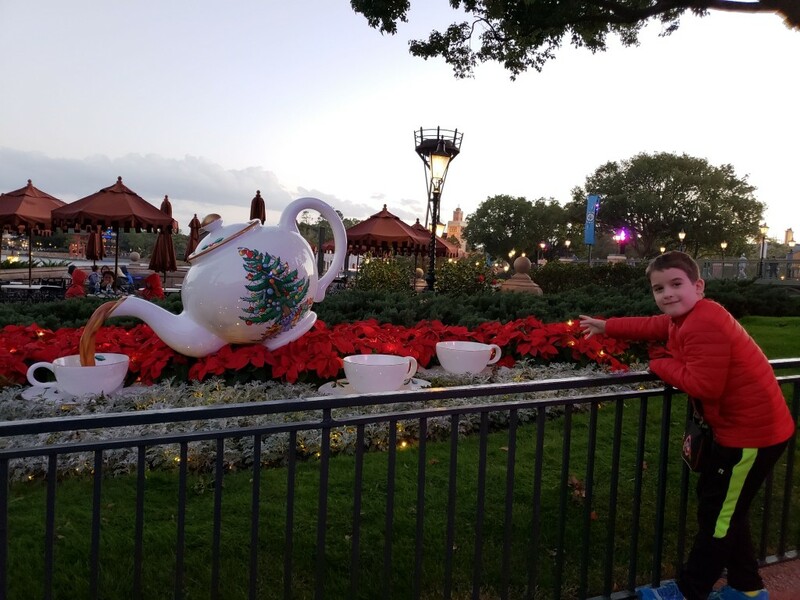 On our last trip to Walt Disney World, we spent a little more time in the England pavilion than we had previously. We ate lunch at Rose & Crown and enjoyed the Christmas decorations. 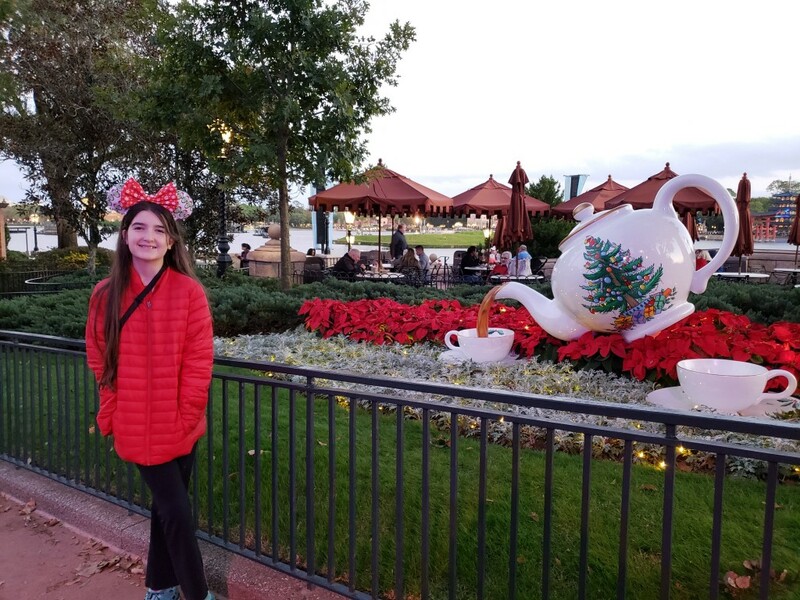 In this post, I will share photos from our time in the England pavilion, England-themed lunches I recently packed for my kids, and photos from a few character meet and greets. 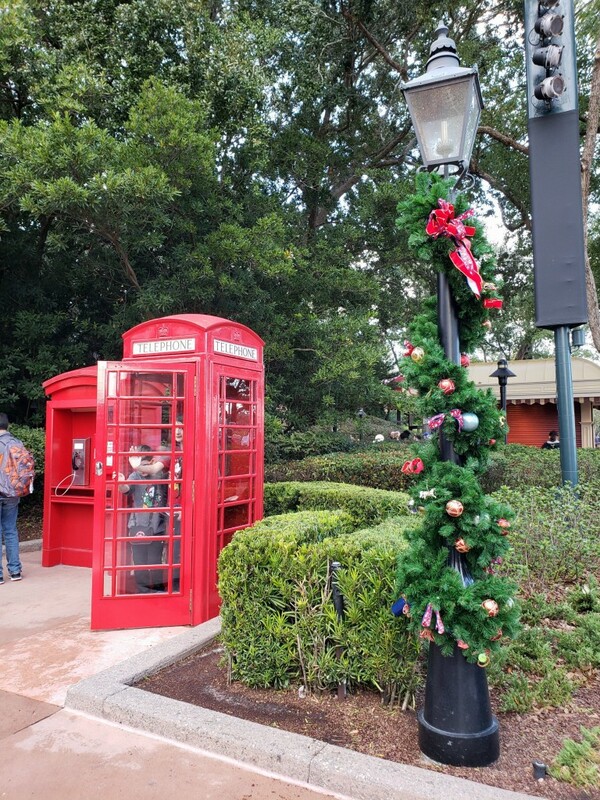 Before our lunch at Rose & Crown, we explored the nearby gardens and the red telephone booths. 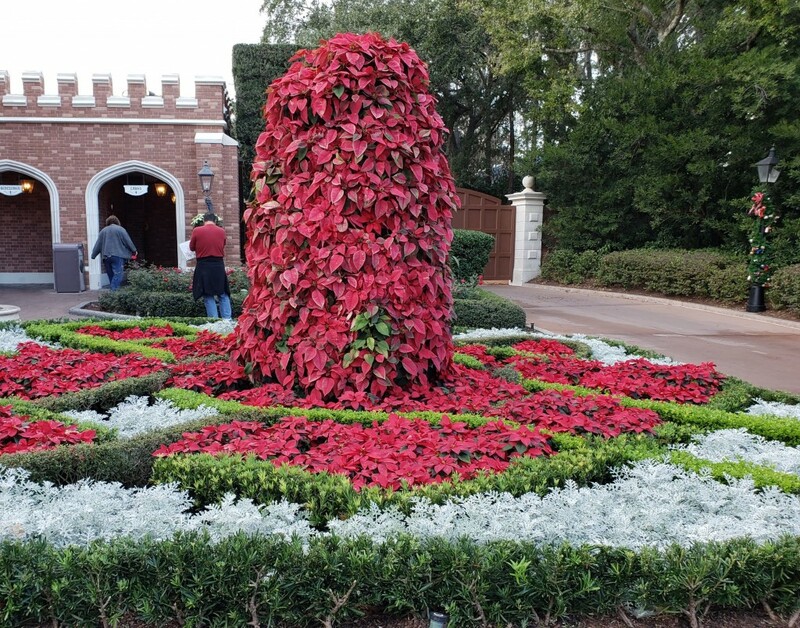 This was during December so there were lots of poinsettias in the gardens. 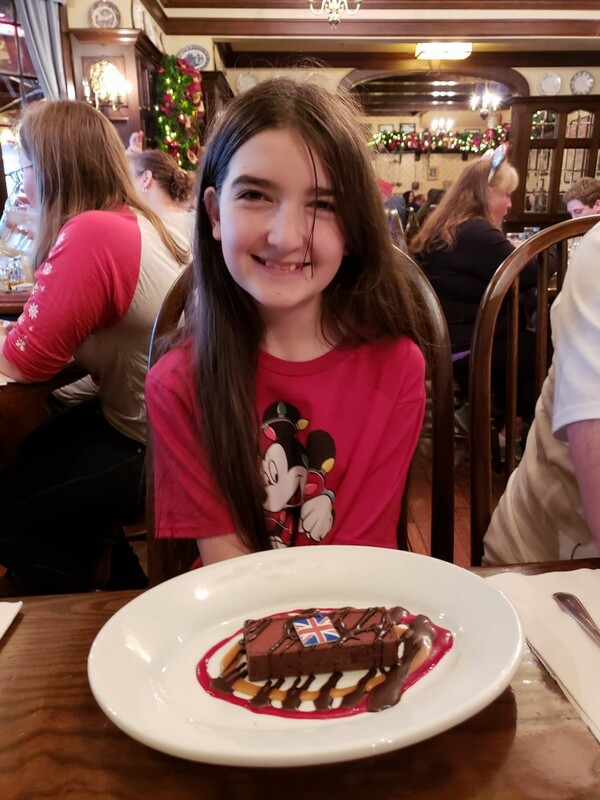 Our reservation at Rose & Crown was a Candlelight Processional dining package so it included certain food selections including a choice of appetizer, entree, and dessert for each person. 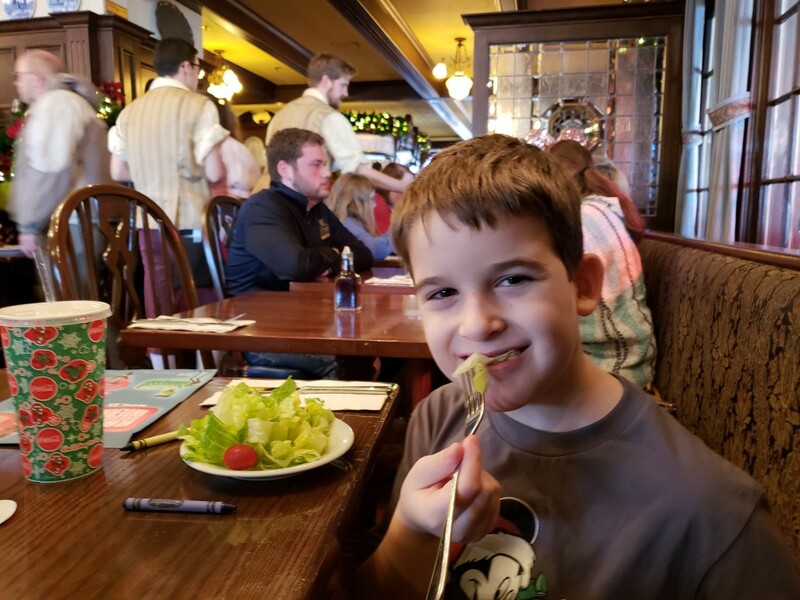 My son chose a salad for his appetizer and ate every last bit of it. 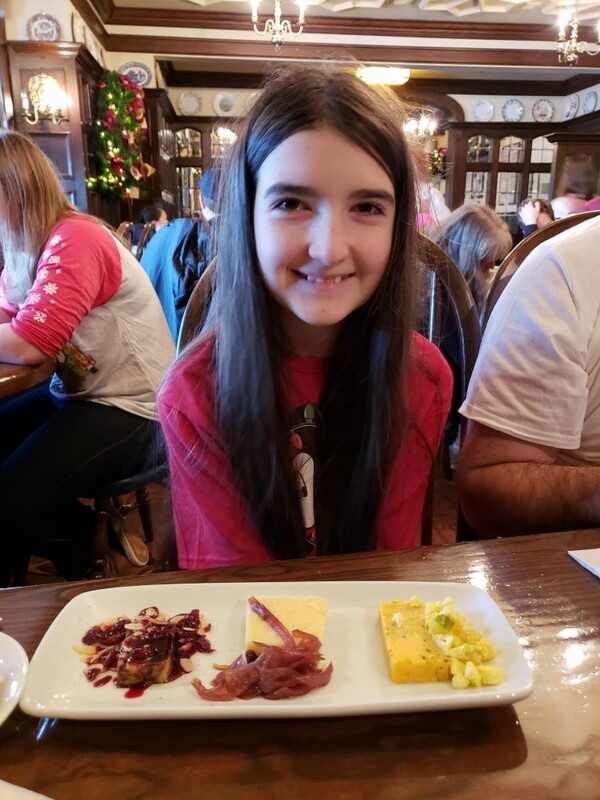 My daughter is an “adult” according to Disney dining rules so she receives an adult menu at Disney restaurants. She chose the United Kingdom Cheese Platter, described as “a selection of Traditional British Cheeses with Accompaniments” on the menu. She likes cheese and willingly tried all three. She liked the cheeses but wasn’t crazy about the accompaniments so she shared those with us. Apparently I did not take photos of the food my husband and I ordered. I remember he had soup and I had salad. Both were good. 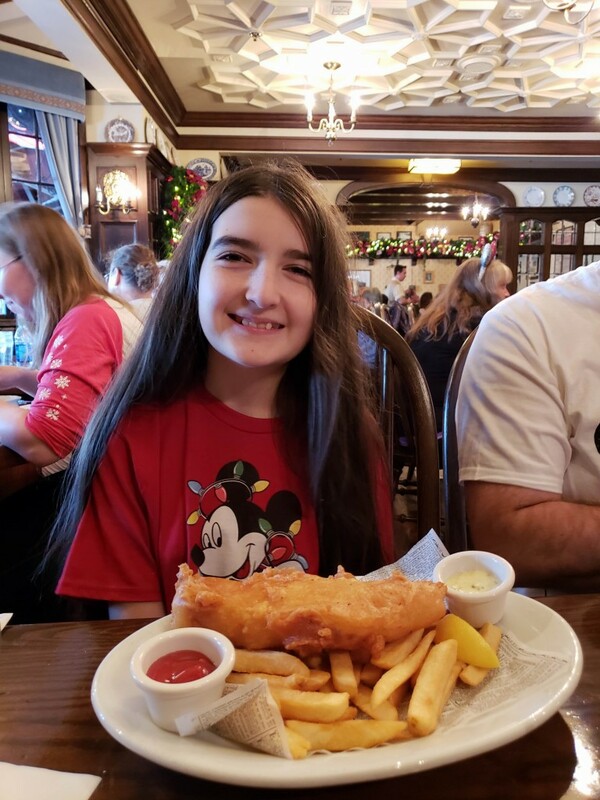 Our kids chose fish and chips for their entrees. 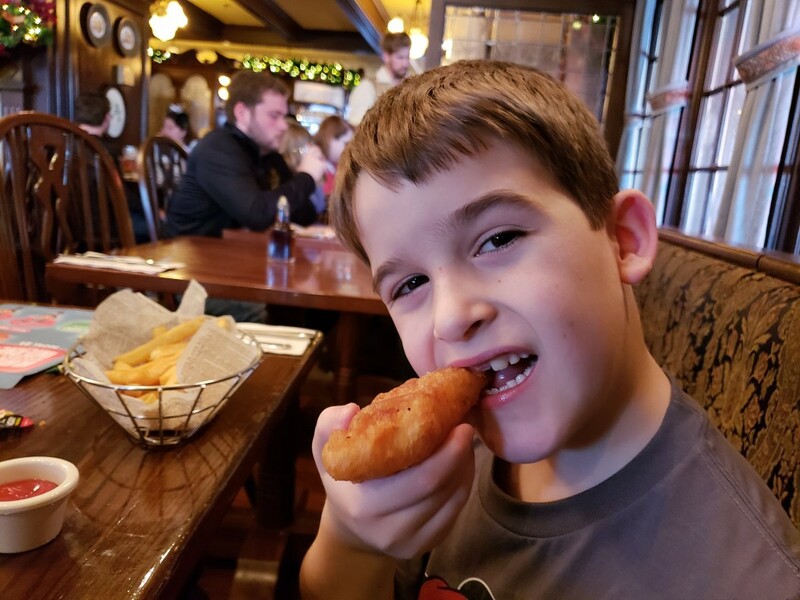 My son is not a big fan of meat and generally prefers to choose just fruits and vegetables, but he was willing to try the fish. Our daughter likes several kinds of fish, but usually eats it broiled or grilled. This was her first time eating breaded fish of this type and she found out that she really likes it. I have made this type of fish for her a few times at home since then and she still enjoys it. My husband and I shared the Guinness-braised Beef Short Ribs and the Chicken Masala Curry. Both dishes were really good and high-quality, but I don’t have photos of those. For dessert, I had the English trifle. 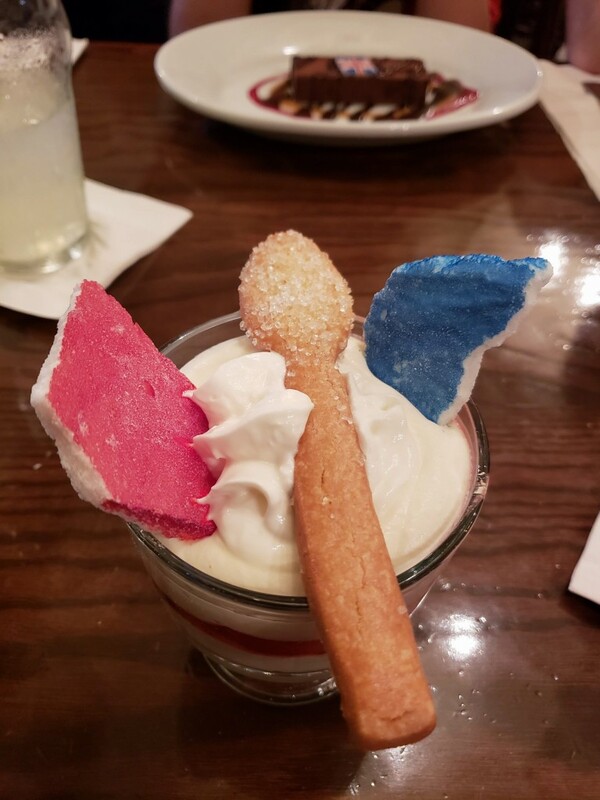 At the time, they were celebrating the release of the new Mary Poppins movie so it was served with a spoon shaped sugar cookie. My son quickly swiped that from me. He also ordered the trifle, but the kids’ version did not include the cookie. 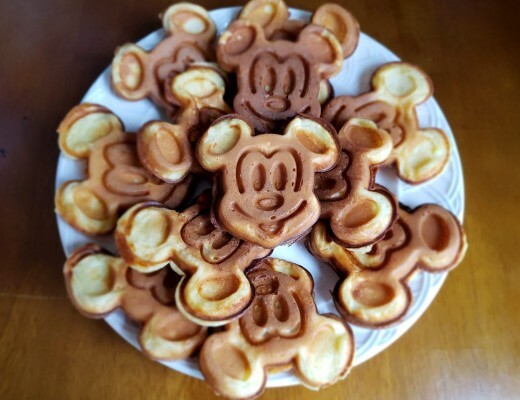 Instead, it was covered in Mickey sprinkles. Our daughter is a big fan of chocolate so she chose the Chocolate Nougat Bar. She loved it. After eating, we spent some more time enjoying the decorations. We thought these Spode Christmas dishes were really pretty. 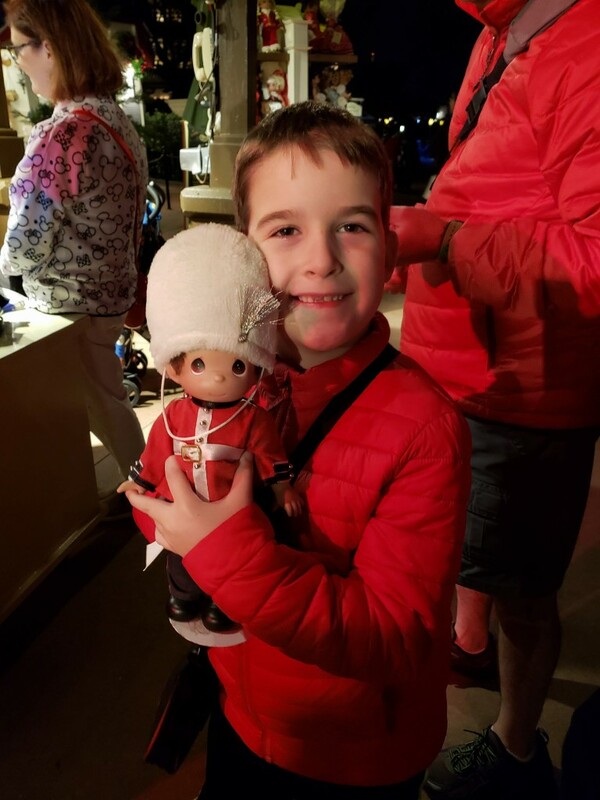 Our son picked out an English soldier as a special souvenir to remember his first Christmas time trip to Walt Disney World. 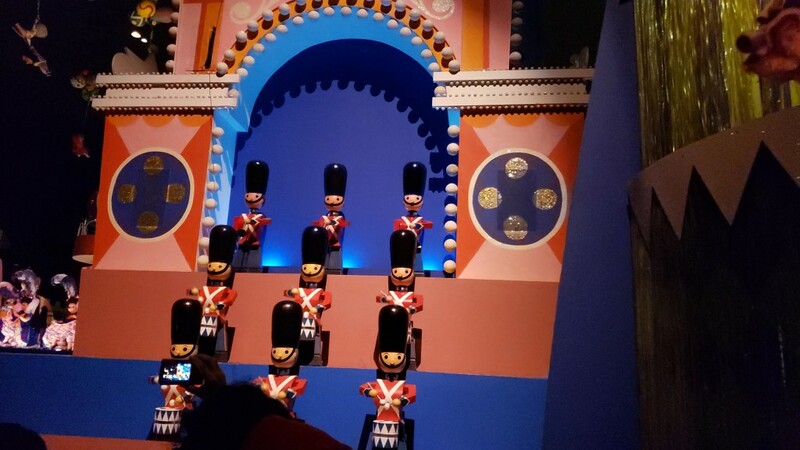 He loves identifying the countries when we ride Small World and always enjoys the soldiers near the beginning of the ride. 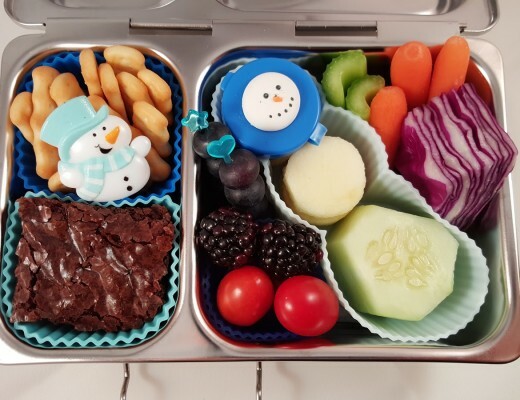 We recently had a week of school lunches featuring several countries. 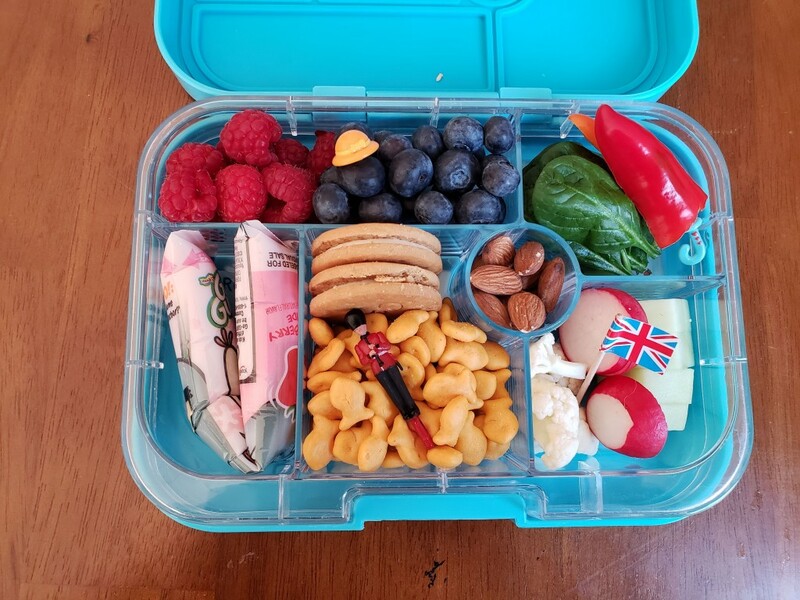 England was one of the countries and the lunch I packed for my daughter is below. I included red raspberries and blueberries to represent two of the main colors in the United Kingdom flag. I stuck a bonnet shaped pick in the berries to represent the fashionable hats famous in England. I included a soldier pick in the Goldfish crackers (which were a play on fish and chips). I used pepper slices and an umbrella handle pick to make an umbrella to represent the rainy days common in London. 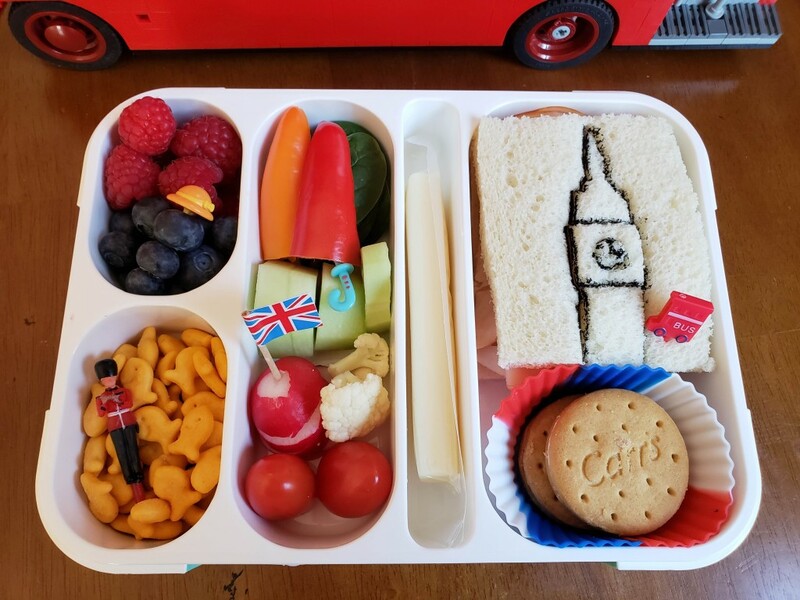 I included a flag pick and I used a cookie cutter to imprint Big Ben on the sandwich. I also found a red bus pick to add to the sandwich. I bought lemon Carr cookies to include as the dessert, which represented English tea time. My son’s lunch included several of the same features but had almonds and yogurt in place of the sandwich. 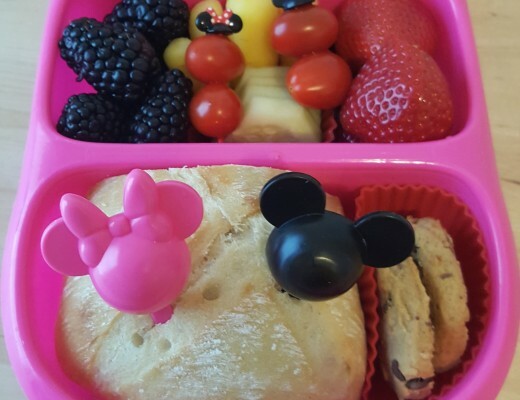 Both kids enjoyed this lunch theme. To end this post, I will share photos from three meet and greets. 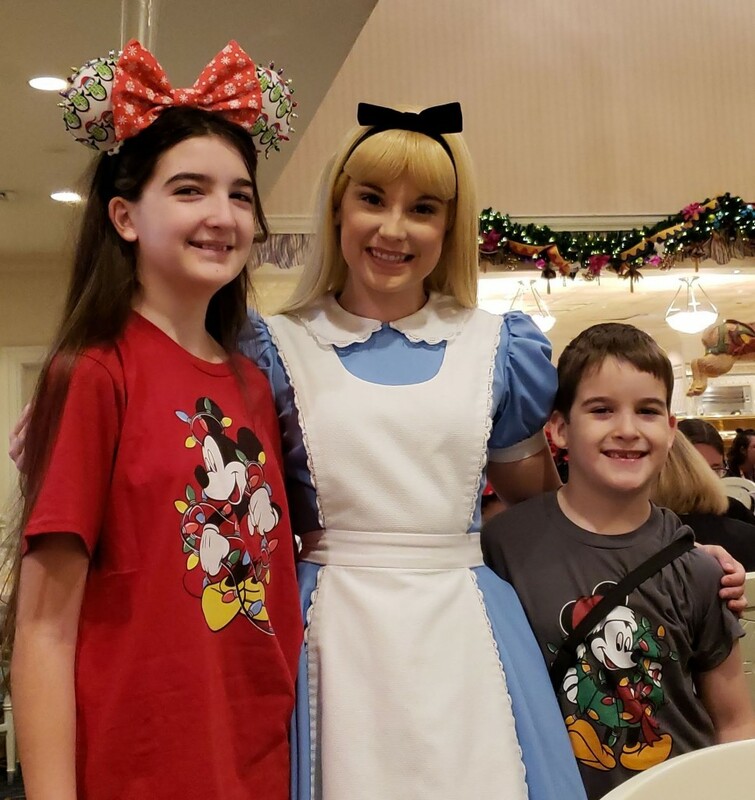 We met these characters at the Supercalifragilistic breakfast at 1900 Park Fare in the Grand Floridian Resort, but Mary Poppins and Alice often have daily scheduled meet and greets in the England pavilion. 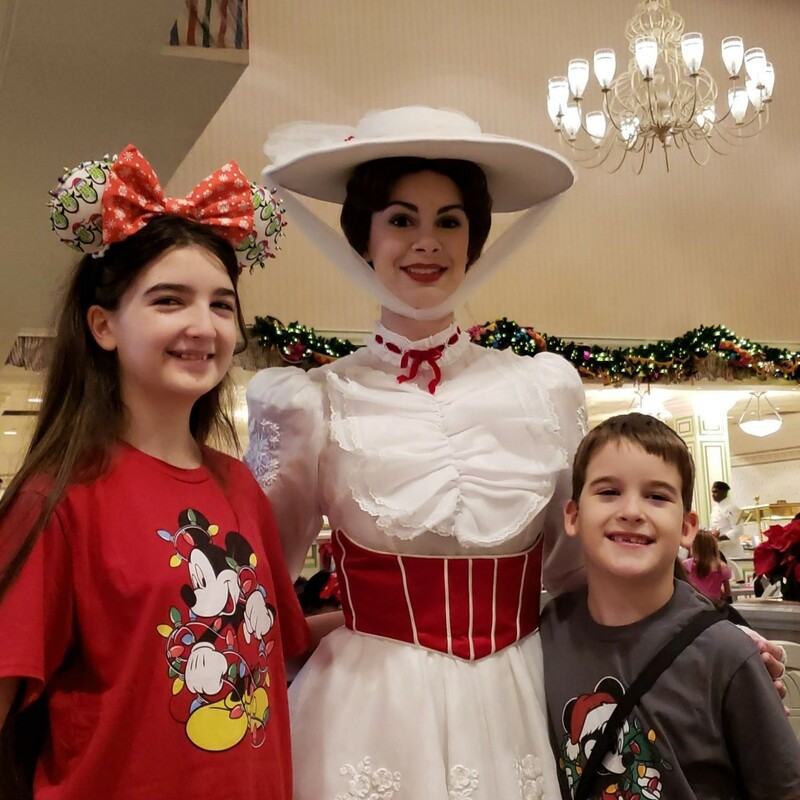 We loved Mary Poppins’s dress and were impressed with how impeccably clean the white material was! 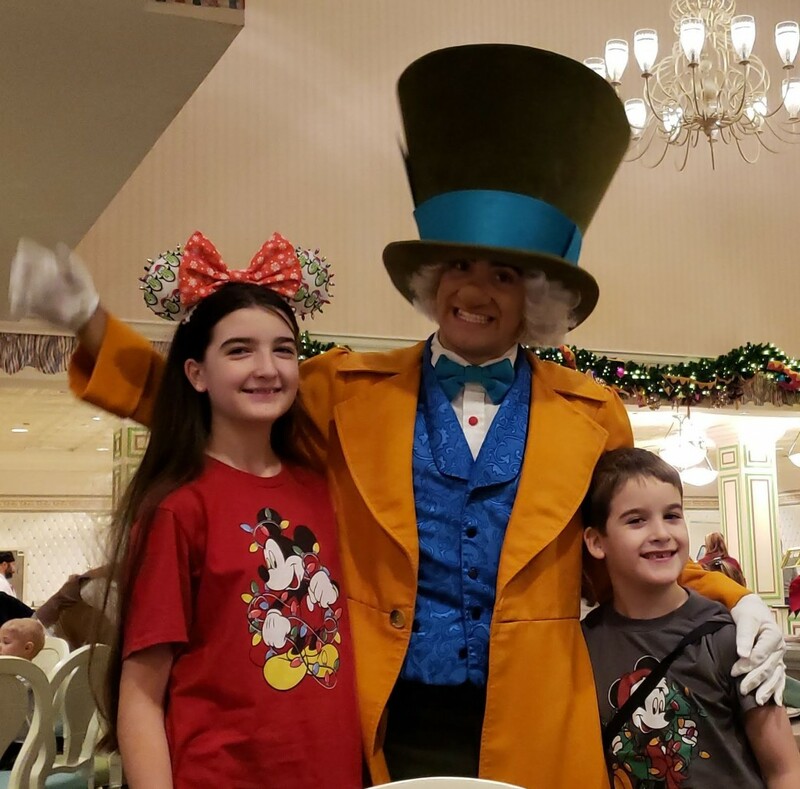 The Mad Hatter was lots of fun. His silliness really entertained our son. Thanks for reading. I hope you enjoyed seeing some of the fun we had.